The swap last month with Lefty Productions was to create and swap Fire and Ice tags. I used the Prima Paper Doll stamps by Julie Nutting, which totally remind me of my Nanny who used to draw paper dolls for us. I used Distress Paints to sponge through a stencil onto the background of a vanilla cardstock tag (above), and then I sponged Distress Inks over the background and the paint acts as a resist (below). Next I sponged Distress Ink on top through another stencil and then added some stamping with black ink and used Brilliance ink in blue and pink to stamp a scroll stamp on each stamp. I love this ink, it's so shiny! For the dolls, I stamped them with brown waterproof ink onto watercolour paper and then water-coloured the skin and hair with Distress Markers. I paper pieced the dresses and added glitter to the headbands. After gluing down the dolls to the tags I added some embellishments and a piece of yarn to the top. 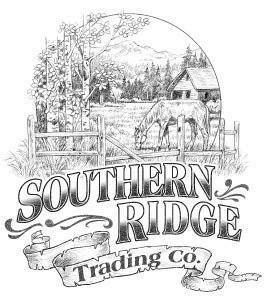 Hope you all have a chance to get some crafting done this weekend! Simon Says Wednesday Challenge - Bling it on! I wanted to share an adorable little penguin card I made for the playgroup teacher and her little daughter where Erica and I go. The little girl who's about 18 months absolutely loves penguins so I thought this would be perfect! I used the Art Philosophy Cricut cartridge for the ornament card, which I cut in a pool colour and heat embossed white snowflakes on, using 3 different stamp sizes. I added some Snowcap paint dauber to the bottom for snow and cut the cute penguin and the string of lights using the Create A Critter cartridge. I added a holly sticker to the scarf and some sparkly Stickles on the scarf and lights. The inside envelope view showing the patterned paper. I hope you all had a very Merry Christmas and are enjoying a very pleasant holiday after! Wow, how did December fly by so quick?!!! In November I felt like I had everything under control and now I feel like I'm scrambling. But, of course, I have a list (a long list) so I feel like I'm progressing :). I just had to make a layout for the December Sketchy Challenge at Canadian Scrapbooker, and I pulled out some pics I just took after an early November snow this year when the girls headed outside to play. Erica is so excited to get outside and experience snow, since, of course, she doesn't remember last winter! It is very exciting to say the least. The background paper is from the Heidi Swapp Believe collection, and the smaller patterned papers are from the Simon Says Stamp December card kit. I also used the stencil from this kit and sponged snowflakes with Distress Ink, as well as the really cute mitten stamps from the kit. I stamped the mittens on striped paper, then the little heart stamps in the set on the mittens and used a white gel pen to highlight the zigzags. I used some snowflake die cuts from the Art Philosophy Cricut Cartridge, which I sponged with Distress Ink and added Stickles to. The letters are by Kelly Purkey, included in the SSS December kit. The little tags are cut out of the Heidi Swapp paper. Just love this little snowflake stencil, which came in the SSS Dec kit! I think the snow is here to stay so I can foresee lots of snow pages this year! I recently picked up the Believe Christmas paper by Heidi Swapp and I just love it! 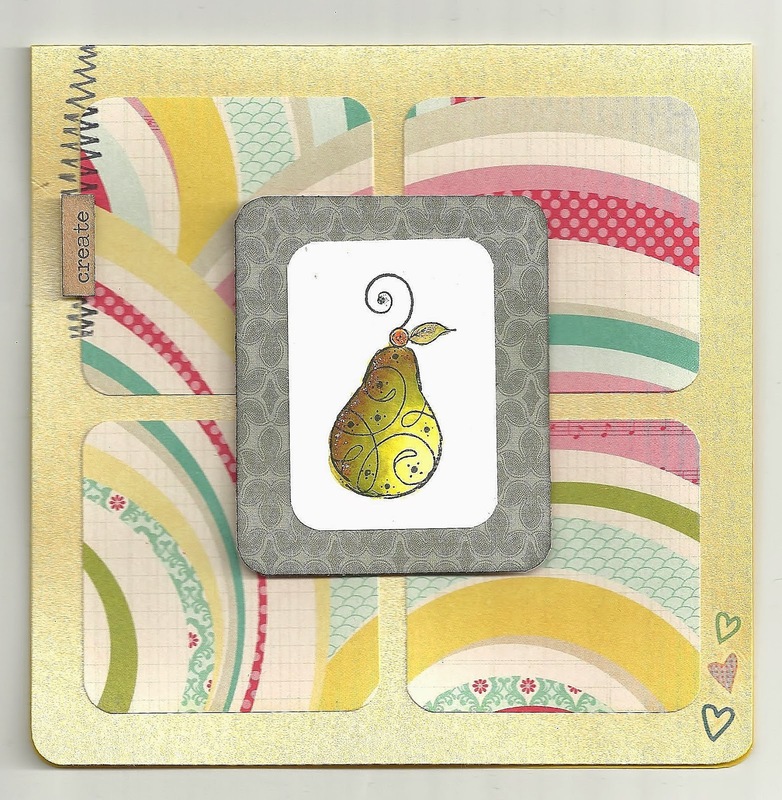 I used the sketch at Die Cuttin Divas to create this cute card and used this paper pack. The gingerbread man and scalloped rectangle is a cut from Just Because Cards Cricut Cartridge. I added the white icing with a Gellyroll white pen and used black Enamel Accents for the eyes. I had to have some Stickles on there, of course, and used them for his mouth and buttons. Hope you are all enjoying the Holiday Season - I must start mailing out some of these cards now! There is a great sketch right now at Die-Cuttin Divas. I pulled out the snowflake stencil from my Simon Says December 2013 card kit and sponged with Distress Inks to create a cool background. The so cute little mitten stamps came with the kit as well, and I stamped on some AC cardstock, which has texture on one side, creating a neat fabric effect when stamped on. I die-cut the scalloped rectangle from the Just Because Cards cartridge and sponged a little ink around the edges before popping it up with some foam dots. I am really enjoying the Simon Says December Card Kit! It is the first kit I have received from them and am so pleased with it. I love that there are so many samples and videos from their amazing design team to get ideas from, and there are enough supplies to make a lot of cards! 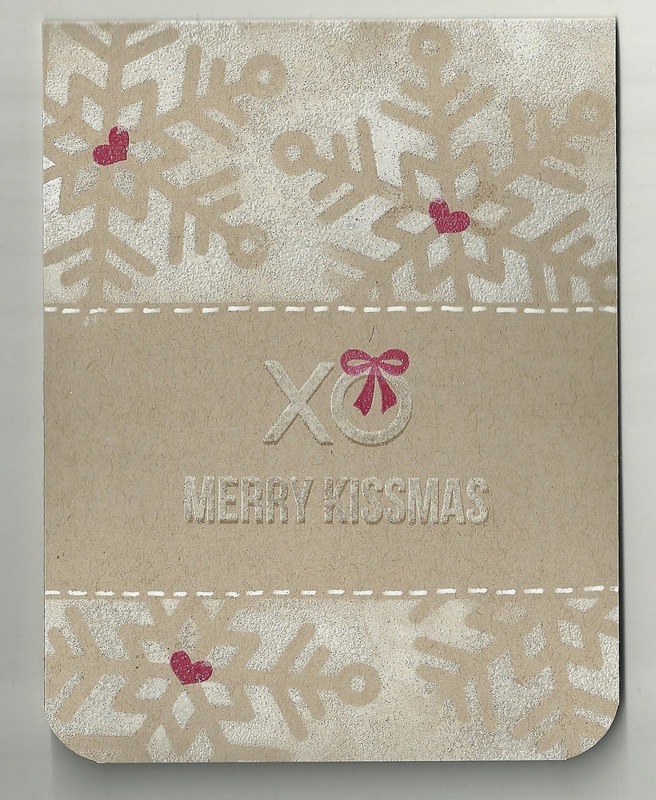 For this card I used May Flaum's example - this cute snowflake stencil is amazing! I used Distress Ink to sponge over the stencil, around the sentiment (also included in the kit) to create a background. I used a white gel pen to create dots on the hearts and scattered the sequins around, gluing with Glossy Accents. I popped up the stamped piece as well as the sentiment banner, both sponged with pink Distress Ink. You can check out the gallery at Simon Says Stamp to see more inspiration! I just love these Tim Holtz blueprint stamps! I decided to try out my new Distress Markers (Christmas gift to myself!) and thought they would make cute tag fronts. I first stamped with Archival ink in black on watercolour paper and then used the Distress Markers to watercolour in the images. I absolutely love how these markers blend. I still really like my Tombows, but these are much softer colours and give a completely different look. After colouring the images in I sponged on Distress Ink around the edges and tied on some Baker's Twine. 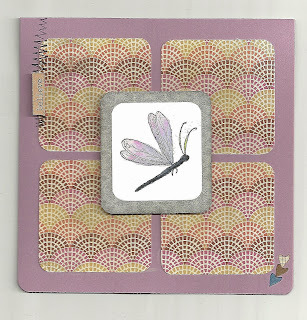 This week's challenge at Simon Says Wednesday Challenge Blog is to create a background without using patterned papers. 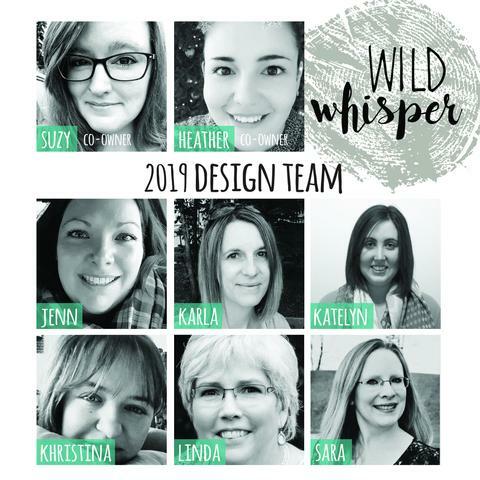 Check out the amazing samples the design team has put together! The Make 'n Take I did this week was an amazingly cute Snow Globe card that was die-cut with Impression Obsession dies. The background was a stamp we coloured in with Tombow markers and then placed these adorable little deer onto. We then covered the globe with acetate that had been die-cut the same size and embossed with the Swiss Dots folder. We used Stazon to stamp JOY onto the gold metallic paper and added a couple gems. A snow scene fitting for Calgary right now! We have a lot of snow and it doesn't seem to be going anywhere for a while. 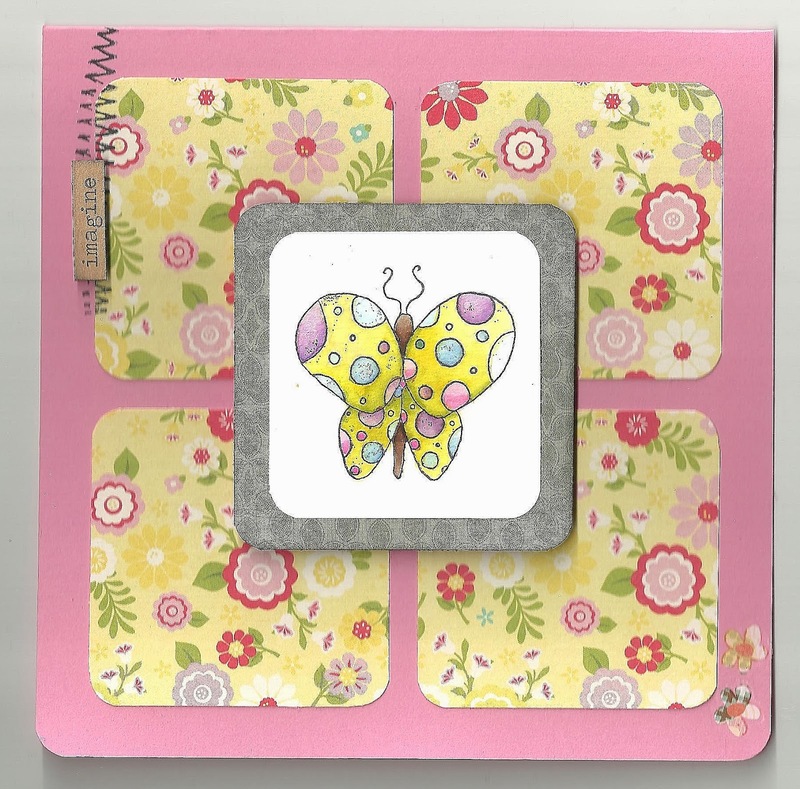 I saw the November sketch on the Scrapbooker's Paradise blog and thought it would be perfect to create a set of cards that I could give as part of a teacher gift. I didn't quite finish quick enough to enter it into their challenge, but definitely wanted to share none the same! I used my 6x6 paper pads - I don't know how I lived without these before! and stamped images that I had in my stash, all watercoloured with Tombow markers, waiting for me to pull them out. 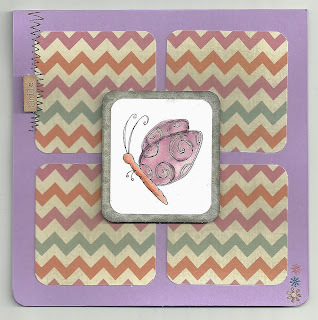 The zigzag stamp is one of Dyan Reaveley's and I added some rub-ons on the right corner and a Tim Holtz Chit-Chat sticker on the top left. I left the insides blank so the recipient could write her own message. I love the look of the rounded corners! Since we are into the countdown to Christmas, and this being one gift I can check off my list, I'm entering into Simon Says Stamp Monday Challenge - Countdown to the Holidays and Simon Says Stamp Wednesday Challenge - Anything Goes! Simon Says December Card Kit! I got a wonderful package in the mail today! The December Card Kit from Simon Says Stamp. 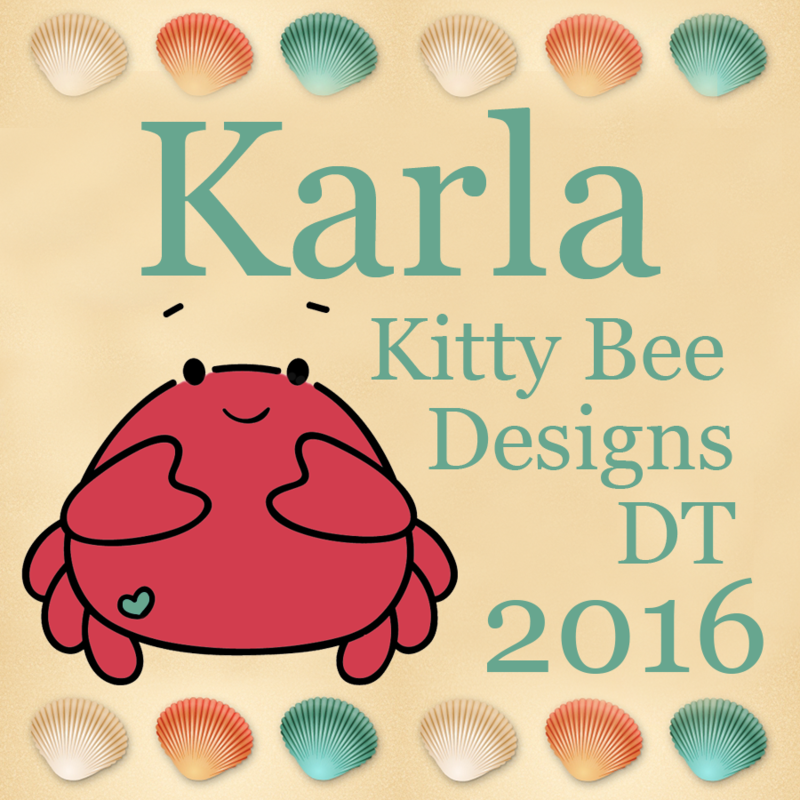 I am so excited to get started on making some fun cards. The great thing about these kits are the fantastic inspirational cards the design team comes up with. There is never a lack of ideas to create with these kits. 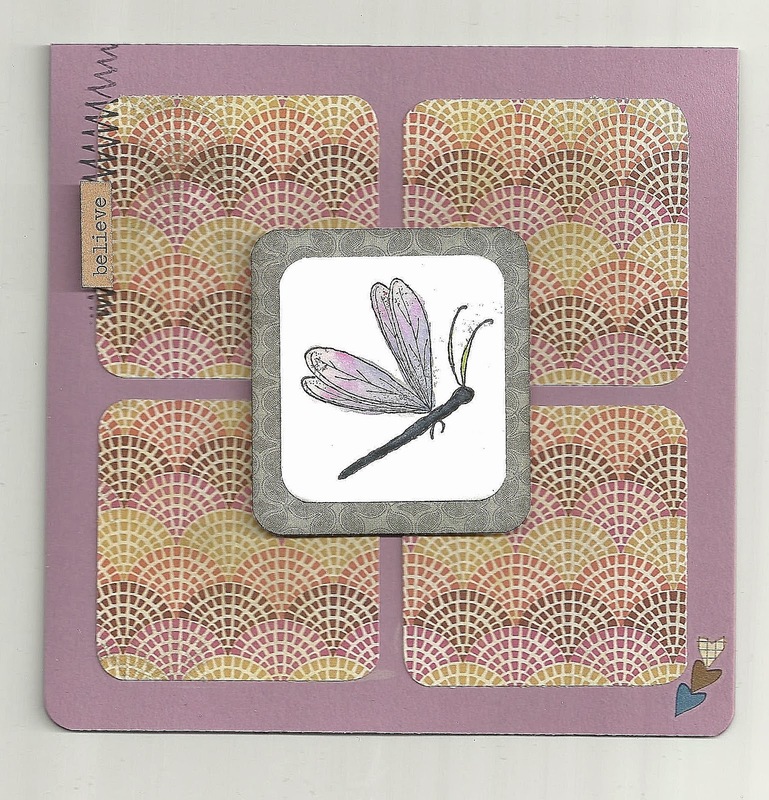 You can see Kristina's post and video showing how to create this card on the SSS blog. 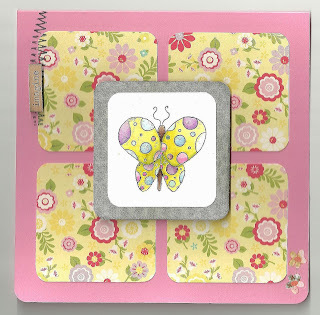 I was able to very quickly make this card - I really like the woodgrain cardstock and the cute sentiment! I'll be heading to my craftroom to whip up more cards using this kit very soon! The great thing about taking the Holiday Card Workshop 2013 from Online Card Classes is that you can keep going back to get more inspiration, watch the videos, check out the amazing gallery... Back on Day 3 I was inspired by Laura Bassen's card (love her plaid stamping!!) and so that's how this Joy card came to be. Since we're counting down to the big day (29 sleeps) I want to get in as many cards as I can before it gets too busy! I started with Kraft cardstock and added some CTMH paper to the bottom, then I cut my Joy from the Create a Critter cartridge in red and black. I love that when you start looking at all the cuts in a cartridge you get so many ideas and notice cuts you never did before! 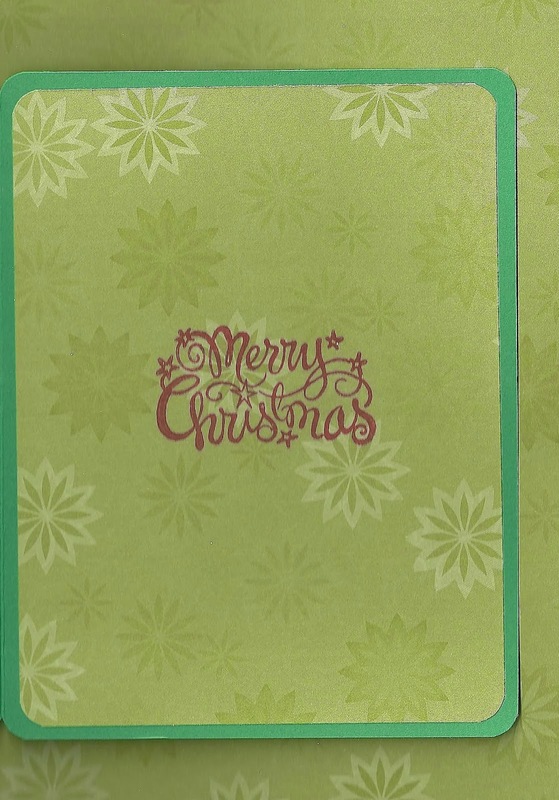 I sponged on some green Distress Inks, heat embossed snowflakes and swirls and a little gold border and then added a stamped sentiment to the center of the card. 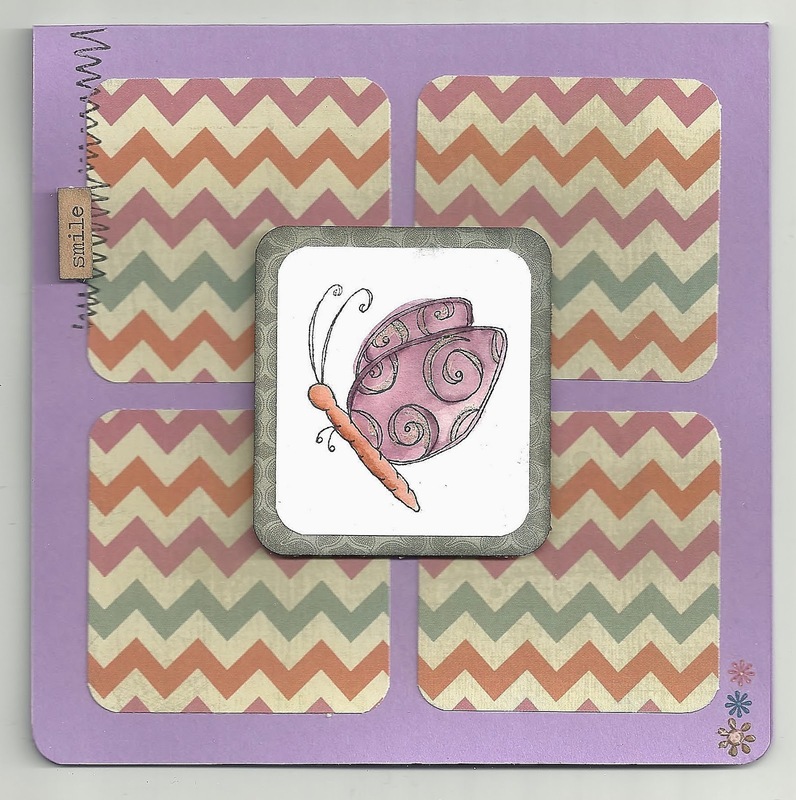 Of course Stickles were added to the Joy die-cut and the center of the border! I used the gold embossing powder again for the stamp inside the card and stamped a sentiment on the back side of the paper I used on the front of the card. 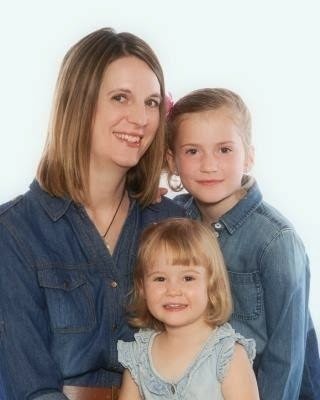 Even though my mind is on Christmas cards this month - I do have several birthdays to celebrate as well! My nephew's birthday is tomorrow and he definitely needed a cute little card. I used the very cute fox cut from the Create a Critter Cricut cartridge and the party hat and windmill from the same cartridge. I used glittery cardstock to cut the green part of the hat and the windmill and a shiny orange cardstock to cut the fox, hat and windmill. Of course I had to heat emboss my sentiment with Crystal embossing powder over Distress Ink. ﻿Mr. Fox is sitting on a log sticker from a camping collection! I cut the center of the windmill out of brown cardstock, but it needed something else, so I added some Ice Stickles. 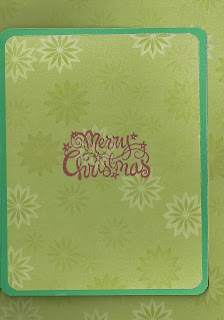 The inside cut is from the same cartridge and I again used the same shiny orange and glittery green cardstocks. Hope you have a great birthday little man! The final day of Holiday Card Workshop 2013 was once again amazing! Kristina Werner created a beautiful card with a scene of a black stamped trees against a blue and black inked background. This 'scene' card theme went perfectly with the card I made with Scrapendipity's Make 'n Take card last week! We used a die from Cheery Lynn to create this fun folded card, which has a matching die to cut the papers that decorate the card outside and inside. We first tore a piece of cardstock into a sloping hill and then sponged Distress Inks along the edge, moving the torn paper up to the top. We then stamped the trees and heat embossed with white embossing powder that had glitter in it - so pretty! Then came the background snowflakes stamped with silver ink, the sentiment heat embossed with black and the die cut snowflakes and ribbon. When I got home I measured the cuts and created my own popped up card, using CTMH paper and creating a similar background for the front of the card. I stamped this one with black trees using a CTMH stamp set, heat embossed the sentiment and stamped on snowflakes with Inkadinkadoo stamps. I used some sparkly Gelly Roll pens and Stickles to decorate my trees. With 29 sleeps to Christmas the countdown is on to get those Christmas cards made so we can start with the mailing out! I really like using non-traditional colours on my Christmas cards and Shari Carroll created a beautiful card for Day 4 of the Holiday Card Workshop 2013, featuring how to stretch your stamps. I used her beautiful card as inspiration to create my own card! 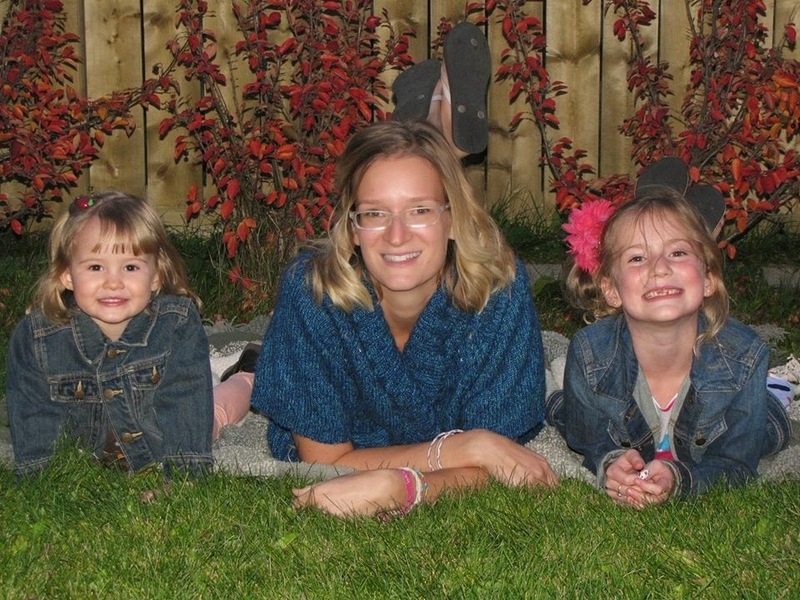 This week the Simon Says Monday Challenge Blog has a Mystery challenge. So, I thought I'd show you my card and let you try to solve the 'mystery' of how I created it! 3) Stamp medium snowflakes with Versamark and heat emboss with Crystal embossing powder (it is clear, but sparkly, so stamp only on the white background. 4) Use a sponge to rub Distress Ink in Tumbled Glass all over the background of the Stamping Paper and then use Peacock Feathers around the edges, blending over the snowflakes well. 5) Stamp Peace sentiment with Versamark and heat emboss with Silver embossing powder. 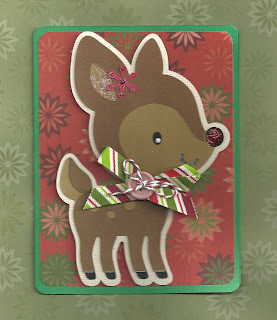 Online Card Classes' newest class, Holiday Card Workshop 2013 has so many great ideas for creating holiday cards! 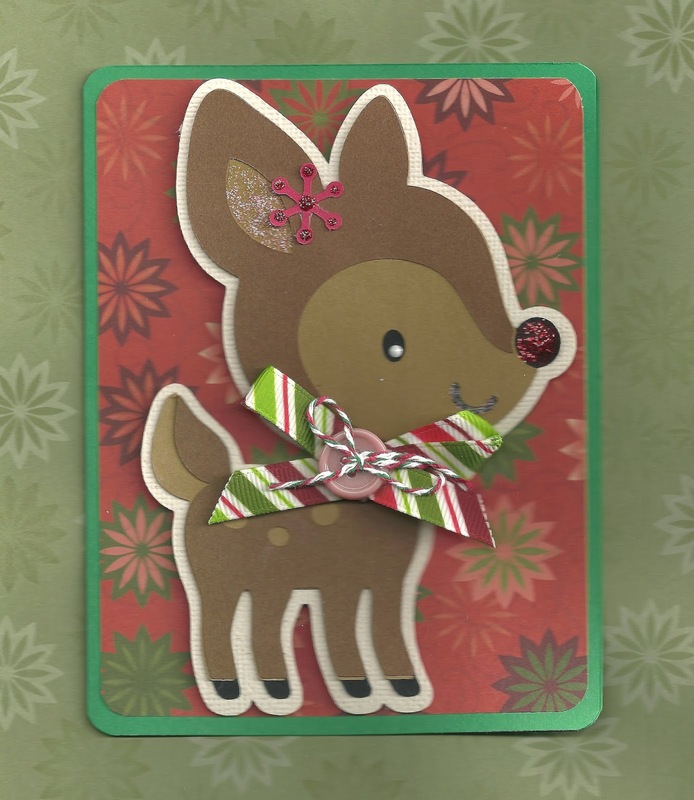 Day 2 featured die-cutting so I decided to make this cute reindeer to match the cute deer friend I made here. I'm thinking I'll give one to each of my little girls for Christmas. You have gotta love it when your 6 year old is excited about opening a card before a gift or when your 2 year old says "NICE!" when she sees a card! 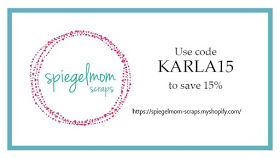 This cut is from the Cricut Create A Critter cartridge and I used my Gypsy to cut everything. I just sized it to fit on a 4x5.5" card and layered it on some CTMH Christmas paper. Of course I added some glittery Stickles for some sparkle on his nose and ears and a real jingle bell tied on with bakers twine. Oh, I really like this little guy!! He is just so darn cute :) Day 2 of Holiday Card Workshop 2013 at Online Card Classes focuses on die-cuts, and I really wanted to use this cute cut from the Cricut Create a Critter cartridge. I cut him with my Gypsy at about 4" high and layered him on some patterned paper from CTMH, the Evensong collection. I added some Stickles to his nose, ear, mouth and snowflake (which came out of the middle of the Joy phrase cut from the same cartridge) and added a dot of white in his eye with Enamel Accents. He had to have a Christmas bow tied around his neck with a red button and some matching baker's twine, and now he's ready for Christmas!